The product champion is responsible for researching and eliciting the voice of the customer and engaging other stakeholders as partners in discovery and delivery. As part of backlog prioritization and ongoing planning, the product champion also decides which requirements will be delivered and when, and she manages the overall strategy and tactics for developing the product. It’s a huge responsibility—arguably, the most important one of all. In spite of its importance, this crucial work is vastly underserved (and unappreciated) when you look at the number of books, websites, conferences, and communities that exist today. Astounding. This is good news. Big changes are coming for the discipline, including more conferences focused on product management. 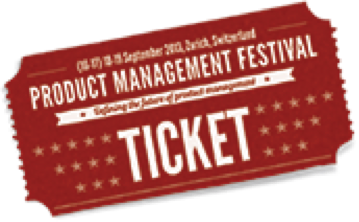 If you’re a product management professional in Europe, you need to know about an exciting new conference coming up in Zurich, Switzerland—Product Management Festival 2013, the week of 16 September. I’m proud to be one of the US-based ambassadors. Our speaker line-up for tutorials, conference presentations, and the facilitated sessions is impressive: Marty Cagan, Christof Ebert, Steven Haines, Roman Pichler, and Gabriel Steinhardt, along with product management pros from Xing, Google, Tecan, and more. I’m pleased to be on the program. I’ll deliver a pre-conference tutorial, “The Essential Product Owner – Championing Successful Products.” I’ll also deliver a presentation on product roadmapping, and I’ll facilitate a lean café. Don’t miss this exciting new event in beautiful Zurich. View the entire program here. Get your ticket here. Whether or not you’re attending, be sure to participate in the Product Management Festival’s “Most Influential Product Management Professional” survey. The award will be given at the event. Follow the event using hashtag #PMF13 and @ProdMgmtF. Hope to see you there, as we continue to learn and define the future of product management!